Democratic lawmakers probably wouldn’t recognize Elisabeth Pearson if she walked into their Capitol Hill office, but they might be owing her their jobs before too long. As executive director of the Democratic Governors Association and a leading strategist in the party’s redistricting efforts, Pearson’s success will determine how long members stay in Washington. “Her job, if not the most important job, is one of the most important jobs in Democratic politics right now,” Democratic Sen. Mark Warner of Virginia said. 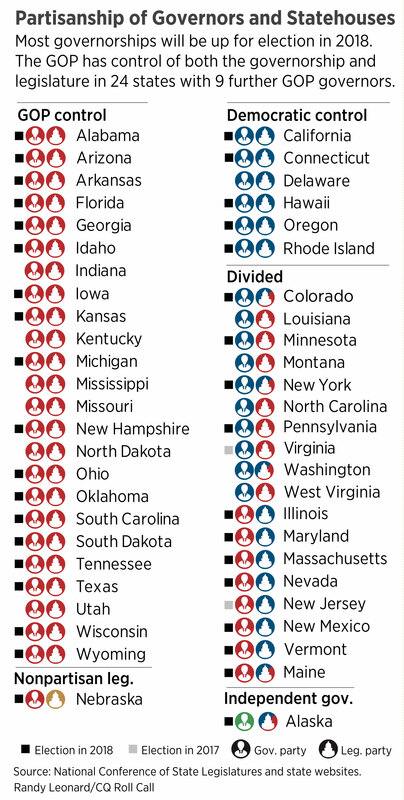 Thirty-eight states will elect a governor over the next two years. And many of those governors will play a critical role in the next round of redistricting, which is scheduled for after the 2020 census. Democrats need governors in Ohio, Pennsylvania, Florida, Wisconsin and Michigan, for example, to ensure Republicans don’t impose new congressional maps that limit Democratic opportunities to gain and hold seats for a decade. With dual roles at the DGA and as a founding board member of the newly formed National Democratic Redistricting Committee, Pearson is critical to Democratic efforts to regain relevancy. Pearson’s political acumen has grown since that day in American Government class at Bowdoin College in Maine when she and her classmates struggled to list all their elected officials. “It was a wake-up call with the level of disengagement,” she recalled. Pearson, 35, was born in Exeter, New Hampshire, but grew up nearby in Kittery Point, Maine, about 70 miles south on the turnpike from Bowdoin. Her mother was a homemaker when she was young and her father worked as a video journalist. The self-described “big jock” played basketball, soccer, and tennis for the Berwick Academy Bulldogs, along with being a part of the math team and Art Honor Society, and attempting to learn Spanish. Despite coming from a family of Democrats, Pearson interned for GOP Sen. Susan Collins of Maine, during her junior year of college through American University’s Washington Semester Program. By the time she graduated from Bowdoin in 2003, Pearson had been infected with the political bug. She moved back to Washington and landed a job at Winning Directions, a prominent Democratic direct-mail firm, where she connected with consultant Alan Moore. “She’s extremely well-organized, very smart, highly respected, and well-liked. All of those attributes normally don’t apply to one person in the political business,” Moore explained. When Moore left in 2004 to lead Virginia Democrats’ coordinated campaign to get Tim Kaine elected governor, Pearson was one of his first hires. As deputy director for the coordinated campaign, she worked as a utility player with the data team, a key liaison with the Kaine campaign, and organized the get-out-the-vote operation in Richmond in the final days of the 2005 race, which Kaine won. When state Del. Jackie Stump resigned, Pearson moved to rural southwest Virginia and managed Democrat Dan Bowling’s campaign. She lived in a motor lodge in Tazewell County for a special election that spanned Christmas and the holidays. Without significant campaign funds, the first-time manager learned how to be efficient with resources and rely on quality volunteers in the successful effort. In 2006, Pearson was campaign director for the Democratic Party of Virginia when Jim Webb knocked off GOP Sen. George Allen. During that cycle, her future husband, Charlie Kelly, managed Phil Kellam’s unsuccessful challenge to GOP Rep. Thelma Drake in Virginia’s 2nd District. The couple first met on the initial Kaine race. After helping guide Democrats back to a majority in the Virginia state Senate in 2007, Pearson was hired by Warner and his team for his U.S. Senate run. Managing the coordinated campaign “is as much about wrestling egos as execution,” Warner said. “She was great at both.” The former Democratic governor cruised to victory while Barack Obama won Virginia at the top of the ballot. Warner was so impressed with Pearson that he wanted her to be his chief political person, “but she still had the campaign bug,” the senator recalled. Henry recalled a football game in Richmond with various local political types. Pearson caught a touchdown pass and casually walked back to her teammates with a bone from her pinkie protruding from her skin. Friends recall that she kept playing with a broken finger, but Pearson admits she later took herself to the emergency room. Pearson, “EP” to many of her friends and colleagues, stayed in Virginia to manage state Treasurer Jody Wagner’s 2009 race for lieutenant governor in what ended up being a challenging political climate. “We witnessed the bottom falling out,” Pearson said. In the first real races during Obama’s first term, Republicans swept the 2009 statewide elections in Virginia. (Wagner lost to Bill Bolling.) The result was jarring for Pearson who, up to that point, had experienced considerable success in politics and sports. “But you learn more from losses. You don’t question yourself when you’re winning,” she said. Wagner compares Pearson to a duck gliding calmly across a pond while paddling intentionally below the surface.“She always made it look like she wasn’t sweating, but I know she was working extremely hard,” she said. Even though Wagner went down to defeat, Pearson’s stock continued to rise. With Democratic Senatorial Campaign Committee political director Martha McKenna as an advocate, Pearson landed a job as deputy political director at the committee. She became the DSCC’s point person to appointed-Sen. Michael Bennet’s campaign in Colorado and learned the value of bridging the divide between candidates and the committees. McKenna described Pearson as “quiet, but a really smart operative.” She remembered the moment on election night when Pearson called Bennet’s victory, which wasn’t officially called until Wednesday morning. McKenna, a Baltimore native, proceeded to connect Pearson with the DGA, which was then led by Maryland Gov. Martin O’Malley. Pearson worked her way up from campaign director (2011-12) to political director (2013-14) to executive director in 2015. Democrats held serve during her first year at the helm by losing Kentucky but picking up Louisiana. And last year, when Democrats experienced a demoralizing loss for president and disappointment in congressional races, the DGA had mixed results. “In a very bad year, we had a relatively good year,” said DGA Chairman Dan Malloy, the governor of Connecticut, citing the Democrats’ high-profile victory in North Carolina. Malloy has no reservations with Pearson calling the shots once again. Pearson’s decision to move the DGA offices off K Street, and other strategic moves saved more than $3 million that was invested into races last cycle. The biggest race this year will be in Virginia, so it will be a home game for Pearson. She lives in Alexandria with her husband (the new executive director of House Majority PAC) and their two young sons. “She’s one of the real talents on our side of the aisle,” Warner added.